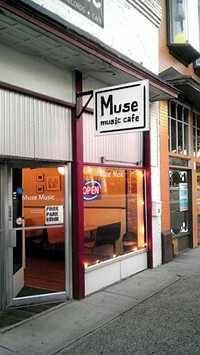 Located on the 100 Block in downtown Provo, Muse Music Cafe (151 N. University Ave., MuseMusicCafe.com) is a popular all-ages music venue, but one that has gone through several changes since opening in 2002. Since Darcie Roy and Debby Phillips took over ownership in 2012, as "a passion project for both of us," Phillips says, they've made improvements to help Muse sustain itself—opening a small snack bar on-site as well as a new 24-hour rehearsal space—but this summer has been particularly slow. In order to keep Muse's doors open, Roy and Phillips need to raise at least $1,900 by Aug. 20; anything raised beyond that amount will go toward critical expenses such as rent, utilities and the staff's wages, as well as paying off the recent upgrades to Muse's sound system. The full goal is $2,500, and the fundraiser will likely remain active until the end of the year. To donate, visit GoFundMe.com/support-local-music. Rumors have been flying recently that Salt Lake City bar and music venue Bar Deluxe (666 S. State, 801-532-2914) was going to close, or at least shut down temporarily. And according to owner Kaci Tokumoto, that was very nearly the case, as plans were in the works to close Bar Deluxe for about a month and later reopen the venue with a new concept. But nothing is changing after all, and Bar Deluxe is staying open as usual. To celebrate, head to Bar Deluxe to check out some live music and grab a beer; visit BarDeluxeSLC.com for the full concert calendar. Salt Lake City sandwich shop Even Stevens Sandwiches (414 E. 200 South, 801-727-7234) is looking for local musicians to play regular gigs in the restaurant during lunch and dinner. To find that talent, Even Stevens—which donates a sandwich to a nonprofit partner for every sandwich sold—is hosting a local music showcase Friday, Aug. 15, from 7 to 10 p.m. for musicians who play family-friendly material and have a sound that will work in an acoustic or low-volume setting. Every musician who's selected for the showcase will get a 15-minute slot (includes setup time) during which to perform. Visit EvenStevens.com/LocalMusic to sign up. Blues hotspot Sun & Moon Cafe is now closed, but the owners are taking their love for live music to the new Bleu Bistro (1615 S. Foothill Drive, Salt Lake City, 801-583-8331), located in Lamplighter Square, near the mouth of Emigration Canyon. Open to the public beginning Aug. 23, Bleu Bistro will feature a roomier interior and patio, performances by national and local blues artists four to five nights a week, and creative small plates and entrees made with local ingredients whenever possible. For more information, visit BleuBistroSLC.com.